Deeply rooted Nova Scotian workboats inspire this custom cruiser. Boats were a source of transportation and income long before they were a source of pleasure. So it’s not surprising to find a workboat’s DNA in the bones of many recreational boats. This is especially true of the trawlers and long-range cruisers we love so much. 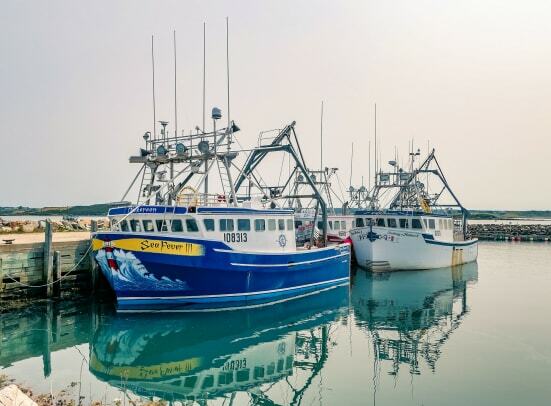 It only takes a brief glance at today’s popular Downeast-style cruisers to see the similarities with their lobster-fishing ancestors. It is interesting, however, to note that while this handsome design so ubiquitous in New England waters is closely associated with Maine, the style was actually derived from a seafaring land even farther “down east” in Nova Scotia. A quiet port after the day’s catch in Peggy’s Cove, Nova Scotia. For centuries the residents of coastal New England and Nova Scotia made their living from the sea; fishermen plied the rich waters of Georges Bank and Cape Sable Island in ketch- or sloop-rigged boats built of oak and pine. By the early 1900s the town of Clark’s Harbour on Nova Scotia’s Cape Sable Island was home to carpenters and shipwrights turning out what would become known as “Cape Island” boats. Around this same time combustion engines were also making their way into working boats. 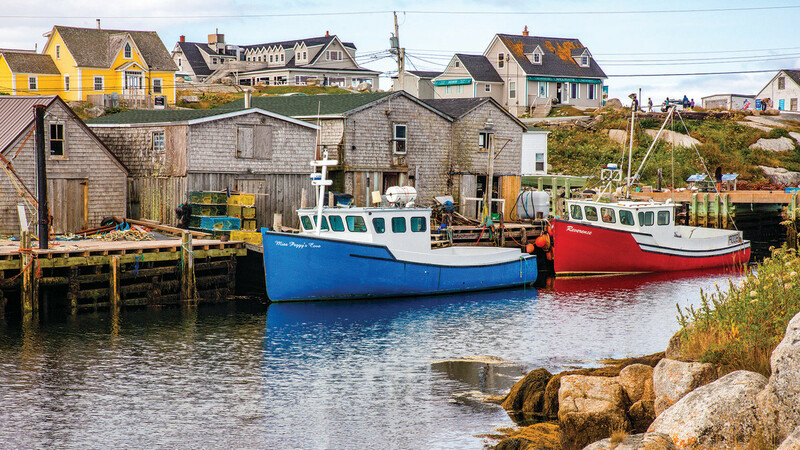 Two enterprising young carpenters in Clark’s Harbour—Ephraim Atkinson and William Kenny—independently started building fishing boats better suited to this new engine power. Though they were not working together, their designs were remarkably similar: Each boat took advantage of the new power options by featuring an engine further forward and a long shaft that ran the length of the keel to a skeg-protected propeller and rudder. These boats were deeper keeled than the traditional boats of the day. They carried wider beams—some were almost half as wide as they were long. 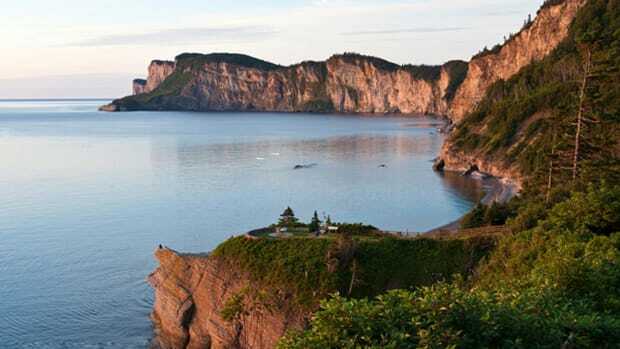 These features allowed fishermen to stay out longer in worse weather and bring in larger loads, and the new designs were so successful that they eventually replaced the wooden sloops that had been in use for almost 200 years. While many believe both Atkinson and Kenny should be credited for developing this new style of fishing boat, Atkinson is largely recognized as the originator of the design. Atkinson’s boats had a reputation as sturdy sea boats: It was well known that you could fish one of his Cape Island boats for years and probably sell it for what you paid for it. As to the name, Cape Sable Island locals call them “Cape Island” boats. Outsiders will sometimes use the term “Novi” or “Cape Islander,” but to a local, a “Cape Islander” is a person, not a boat. A little-known piece of maritime history is that Atkinson sold one of his boats to a Mainer named William Frost around 1920. Frost was the grandfather of the famous New England naval architect Royal Lowell. Many believe that Frost’s early Cape Island boat is the true predecessor of what we now know as the Downeast lobster boat. 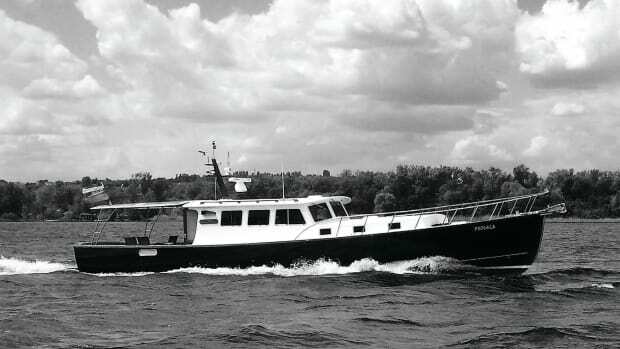 Under the influence of Frost, Lowell, and other Maine builders, the Downeast style continued to evolve to perfectly suit its local use in a growing lobster industry, and today its seaworthy design has translated into one of the most popular recreational boat styles ever built. 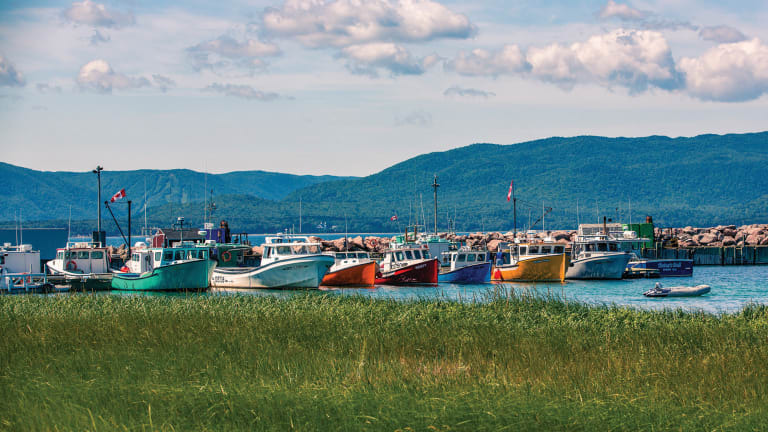 Cape Island boats evolved into slightly different boats to suit the wider range of fishing activities in Nova Scotia. 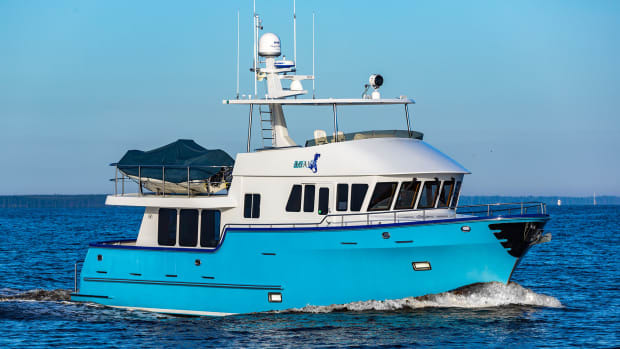 Yet despite minor differences, both the Downeast and Cape Island designs have proven themselves over many years and millions of sea miles to be capable boats. Ephraim Atkinson was fortunate to have three sons committed to continuing their father’s legacy. In 1938 when Ephraim finally retired at 80 years old, he knew his business was in good hands and that his Cape Island boat would live on. And it lived on so well that today approximately 80% of Nova Scotia’s commercial fishing boats under 65 feet are Cape Island designs. The Atkinson family business continued under the guidance of a third generation, and several craftsmen would come out of Atkinson yards to run successful businesses of their own. With an impressive fleet of fishing boats behind them, the company, now led by Ephraim’s grandson Bruce, has continued to build not only fishing boats, but a number of personal trawlers as well. At one point he was even the exclusive builder of Monk Trawlers. 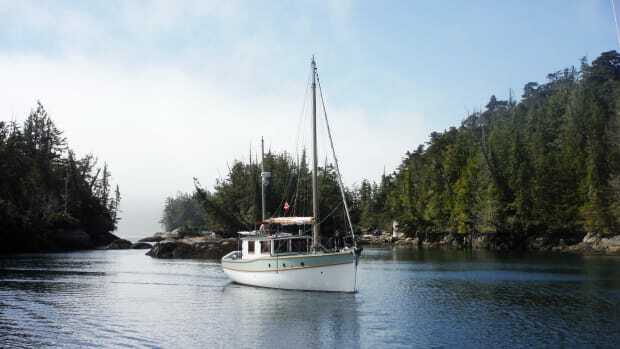 In an interesting turn of history coming full circle, Bruce Atkinson has also built several “Blue Seas” Downeast-style cruisers designed by Royal Lowell. The Cape Island boat was never meant to be fast; it is built for seaworthiness and carrying capacity. They are known to be “tanks” on the sea. With a broad beam and deep keel, Cape Island boats track straight, and with sharp entries and soft chines they open a head sea easily and allow a quartering sea to gently pass beneath them with little yawing or movement. John and Marie-Anne in Charleston, South Carolina. 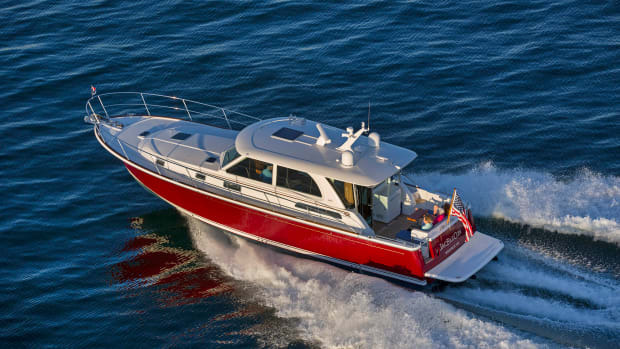 It’s little wonder that so many recreational boaters are drawn to the proven design and the known quality of the families that build these boats. 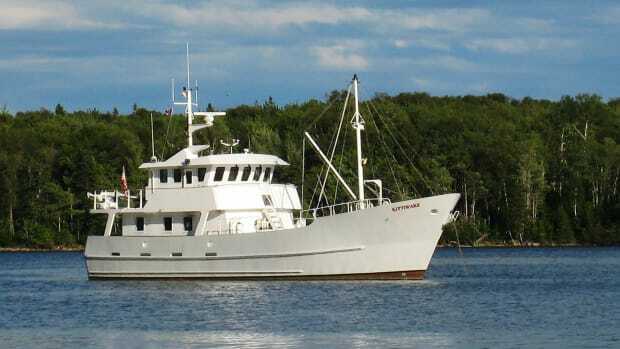 John Cowan and Marie-Anne Erki were one such couple when they began their quest for a safe, capable cruiser. With their retirement a few years away, Marie-Anne and John wanted to build and take delivery of a new boat while still in their home waters of Lake Ontario. This would give them a few years to shake it down before enacting plans to cruise south in the winter. With years of boating experience and multiple degrees in physics and engineering between them, they had developed a list of specific characteristics and features they wanted in a boat. Like many others on a similar quest, the couple started by looking at models currently available on the market. But with such a clear idea of what they wanted, it didn’t take them long to realize they would need to consider a custom—or at least a semicustom—build. A well-timed ad by Bruce Atkinson enticed John to call and inquire about building a version of a Cape Island boat for them. 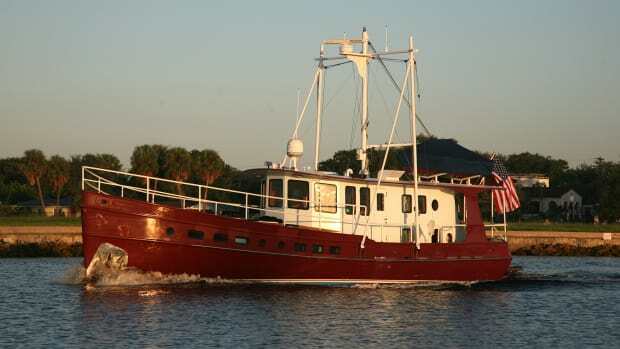 Their quest would culminate in the construction of Irresistible III, a 43-foot custom built trawler. The generously sized and comfortable pilothouse. 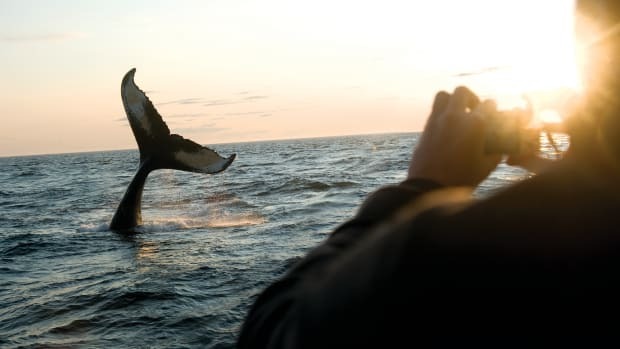 John’s introduction to Bruce Atkinson happened during their three-hour drive from the airport in Halifax to Cape Sable Island. With degrees in both physics and physiology, John is Principal Emeritus at the Royal Military College of Canada (RMC) in Kingston, Ontario. Yet in the car with Bruce on their way to the yard, it was John receiving a lesson in physics and hydrodynamics from the boat builder. While John knew from his research that Cape Island boats had a reputation for being very stable, he hadn’t thought much about why that was. 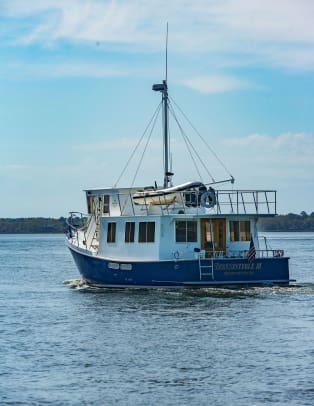 Bruce explained that unlike typical cruising boats, which are either underway or anchored, a fishing boat working longlines or hauling lobster pots is frequently operating at very slow speeds or stopped in the water. In doing so, they don’t have the luxury of always keeping the boat pointed into the seas. Now, imagine crews on their feet moving around the boat handling what can be dangerous gear and you start to see the reason why Cape Island boats are designed and built to be so stable. Bruce also explained the stability needed to be inherent in the hull design as fishing vessels can’t have the underwater components of active stabilizers moving when they have lines in the water. The open salon shows how Irresistible III balances livability with seaworthiness. In addition to stability, John was interested in safety. At RMC, John had access to naval engineers and naval testing facilities, and he was firm in his plans to have their cruiser built like naval vessels, with multiple watertight compartments and pumping capabilities to survive almost any mishap. Bruce was happy to incorporate this idea, along with many others, into the boat. Irresistible III has four watertight compartments below deck, each with high-volume pumps capable of keeping up with a serious incident. A fifth compartment in the bow is foam-filled to serve as a collision compartment. Most offshore cruisers don’t have large open spaces within the boat. Confined walkways and strategically placed bulkheads typically make for safer movement around a boat at sea. However, this configuration doesn’t necessarily make for comfortable living spaces. John and Marie-Ann were determined to find a compromise in this area. The cozy and liveable master stateroom. 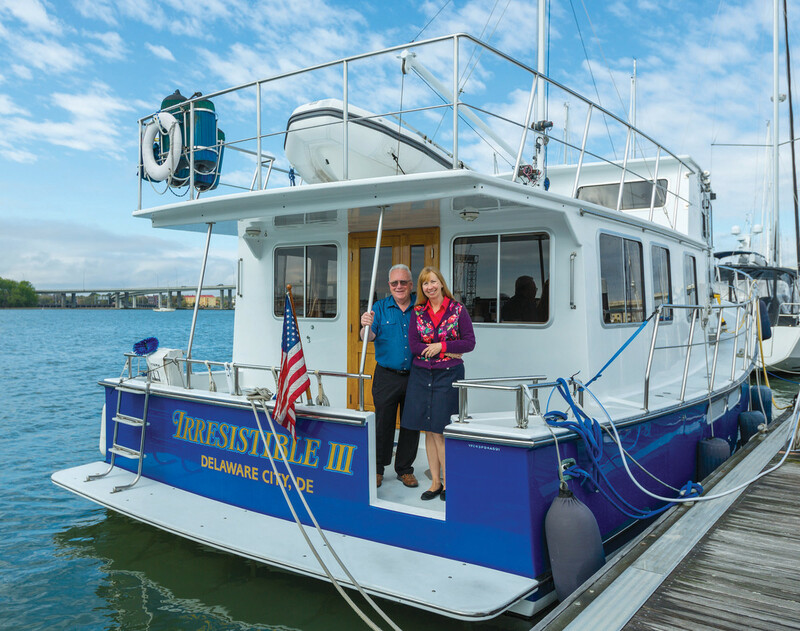 Irresistible III was built to be a comfortable long-range coastal cruiser with generous accommodations, yet still be safe to move around when underway. This was accomplished with well-placed handholds throughout the boat. 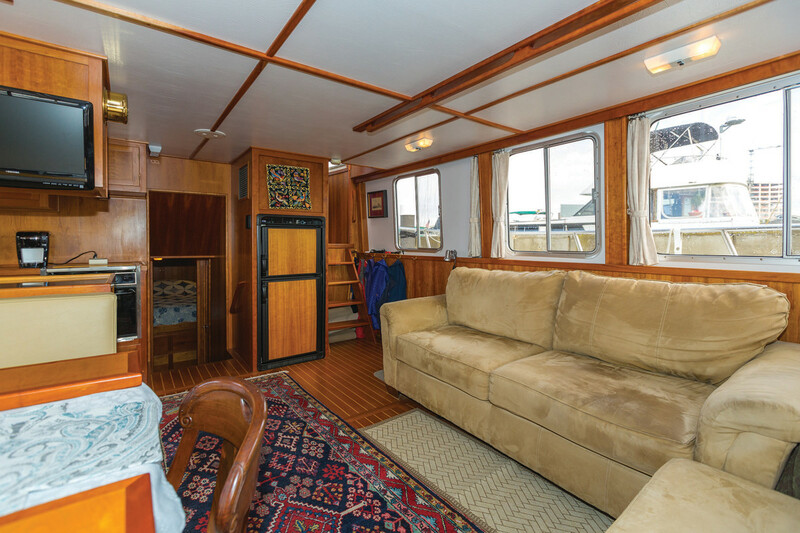 For a boat only 43 feet in length on deck, it has nicely sized living spaces. Taking advantage of the port side being pushed out to the beam, the main saloon has a width of 15 feet. 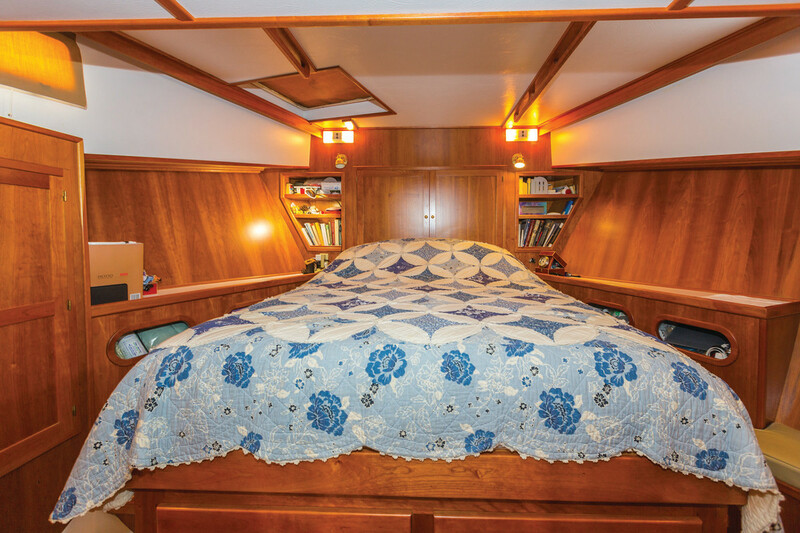 The master stateroom, nearly 12 feet long, starts at the full beam width and only tapers toward the bow. 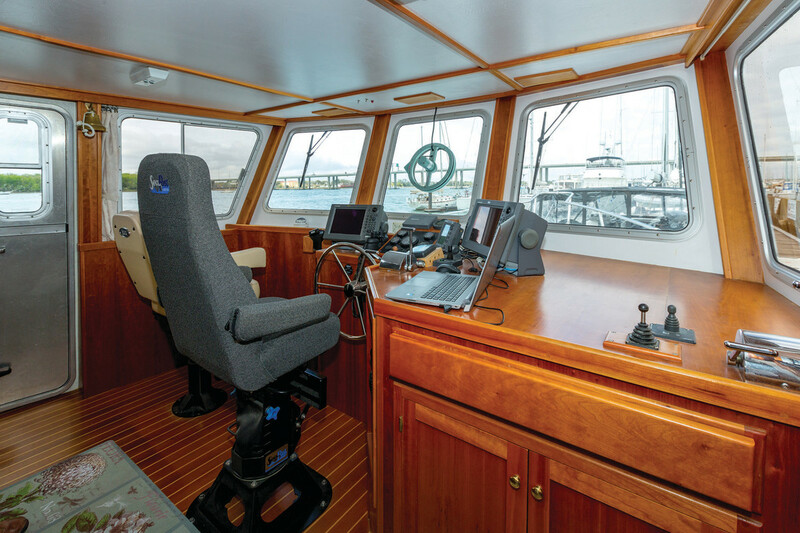 The pilothouse is over 12 feet wide and deep enough for a comfortable watch berth and two helm chairs. They have two large heads, unusual for a single stateroom boat, but a great marriage saver for a couple living aboard. Headroom throughout is a full 6 feet 4 inches. The well-thought-out spaces have proven easy to live in and easy to maintain. 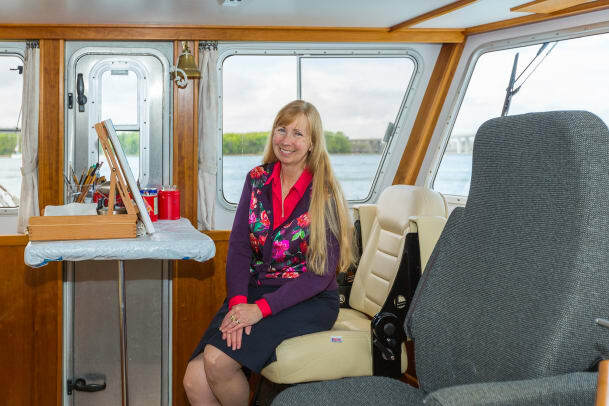 A talented artist, Marie-Anne especially likes that the pilothouse can convert into an art studio, saying it has the perfect light for painting. Irresistible III is powered by an efficient Cummins 660-horsepower engine that gives the boat a comfortable cruise speed of 8.2 knots at 1200 rpm, burning only 4.1 gallons per hour. 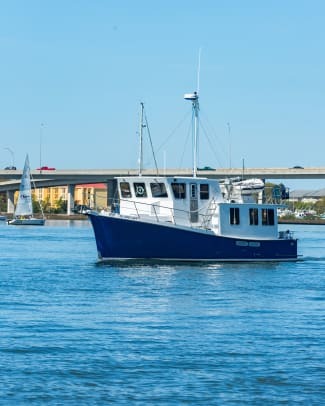 This provides a range of 1,140 nautical miles with a 10% reserve. 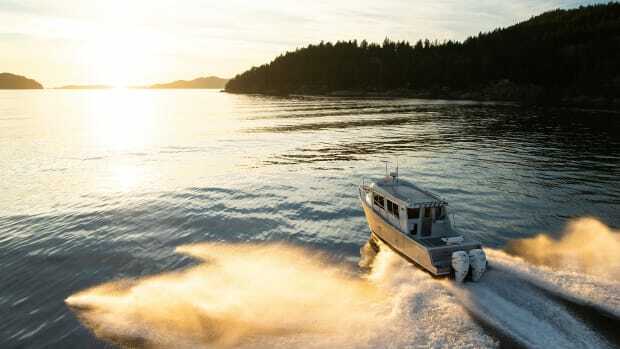 Slowing down to 1000 rpm—the minimum Cummins recommends for continuous operation—increases the range to more than 1,800 nautical miles at a still respectable speed of 7.3 knots. The top speed is approximately 12.5 knots. Not overlooking any detail, John also configured the boat to include rigging for a 215-square-foot headsail and an 85-square-foot mainsail for emergency propulsion. The sails have worked well so far, though they have only been deployed in test runs. The mainsail can also be used as a small steadying sail while at anchor. 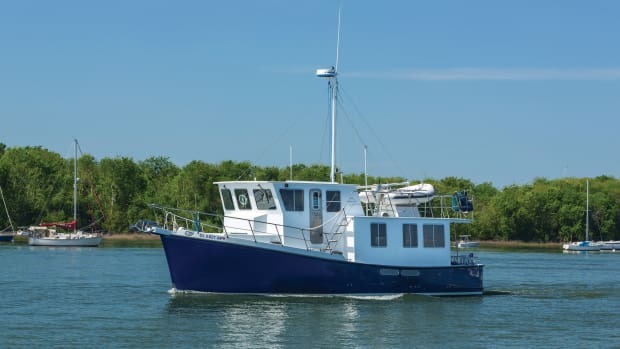 Upon commissioning, John and Marie-Anne took their new boat home to Lake Ontario from Nova Scotia by way of the Gulf of St. Lawrence and the St. Lawrence Seaway. Quite a first cruise, but Irresistible III handled all of it perfectly. They continue to cruise the Intracoastal Waterway each year. John and Marie-Anne appreciate the contribution that years of hardworking crews aboard fishing trawlers have made to boats like theirs. They feel a kinship with the past and present whenever they pass a working boat on the water. Ephraim Atkinson would no doubt be proud of the boats being built under his name today and would likely take comfort knowing his designs continue to be safe working boats as well as comfortable liveaboard cruisers.